Nothing quite compares to the flavor of fresh herbs. However, some varieties are not always in season… so drying those bad boys is the next best thing. Here are a few tips on how to dry fresh herbs at home. In today’s feature, we are going to focus on four of our favorite herbs to dry at home. OREGANO: Most frequently used in Italian and Mexican cuisine, oregano is one of the most popular dried herbs for cooking. It enhances tomato sauces, salad dressings, veggie dishes, marinades and so much more. It’s also one of the easiest herbs to dry. Just grab a clamshell of our pre-cut stems and lay them flat or hang them to dry. Once dried, all you need to do is simply run your fingers down the stems to release the leaves. Make sure to check out our fresh oregano pesto if you’d like to make something other than dried herbs. 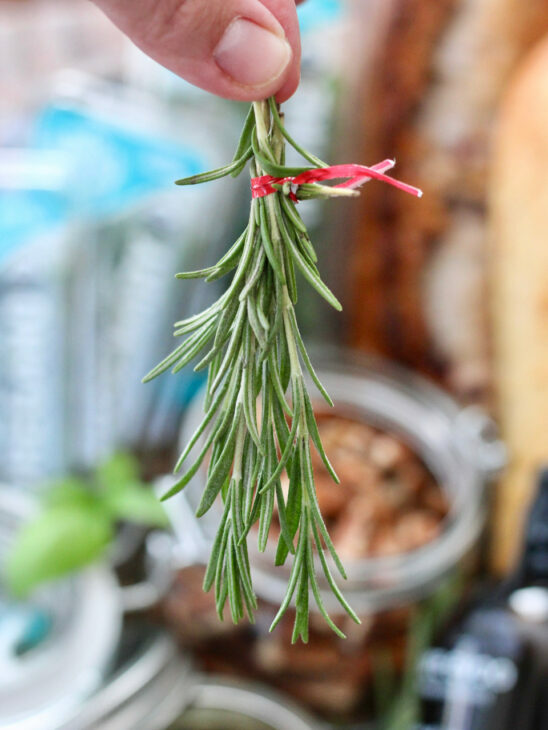 ROSEMARY: It’s time to eat, drink and be rosemary! This herb’s bold flavor creates memorable matches with eggs, biscuits, sweets, lamb, poultry and pork. Rosemary tends to mellow out when dried but please remember that a tiny amount goes a long way. BASIL: This is one of the most versatile herbs used in the kitchen and plentiful during the summer months. It’s a staple in pesto sauces, baked dishes, sandwiches and salads. 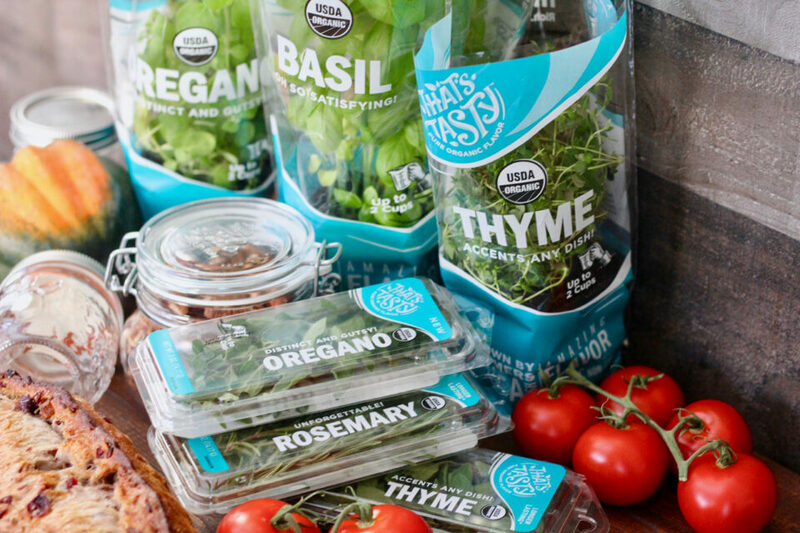 Brighten your winter menu with summer flavor by utilizing dried basil. We recommend cutting our live plants into 4-inch stems, binding them together and then following our method below. THYME: You can’t go wrong with throwing a little thyme in with everything you cook. It’s the ultimate helpmate, as it blends and brightens any other herb you pair it with. When dried, this herb’s flavor becomes much more delicate. Just keep that in mind when adding this to your favorite recipes. Similar to oregano, this herb is extremely easy to dry by lying flat or hanging. Bundle the fresh herbs into small bunches with a twist tie. Twist ties allow you to tighten them, if needed, after the herbs begin to dry and shrink. Hang the bunches upside-down on a coat hanger with clips (leaves facing downward) and wrap them loosely with a thin paper bag. Make sure to cut several holes in the bag for airflow. Allow the bunches to dry in a well-ventilated spot for ten to fourteen days. Depending on the herb’s water content, some may take longer to dry than others. Note: This method works best if you can keep the herbs out of direct sunlight. Herbs are ready for storing when they easily crumble. Make sure to collect the leaves that have fallen inside the paper bag as well. Crumble dried herbs with a mortar and pestle or by hand. Keep crushed herbs in small, airtight containers (canning or spice jars with lids work best). Store in a cool, dry place that’s away from direct sunlight. Dried herbs are best when used within one year (if they last that long… they’re so tasty you’ll want to use them in every dish). Generally, one teaspoon of dried herbs is equivalent to one tablespoon of fresh herbs. 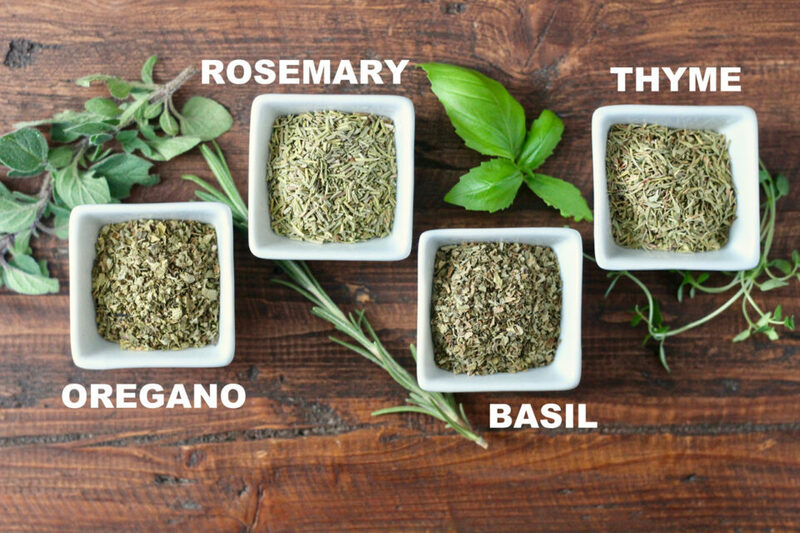 Not all herbs retain the same flavor when dried. Delicate, leafy herbs tend to lose a bit of their kick when dried, so make sure to taste your dishes when replacing dried herbs for fresh in recipes. If you have a few fresh herbs leftover from your holiday feasts, don’t throw them out. Dry them for future use! 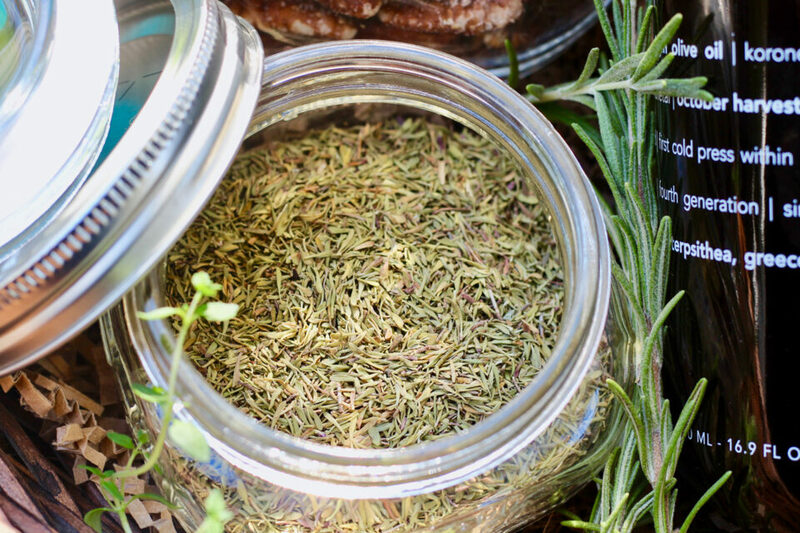 Dried herbs make an excellent gift for the holidays. Here are a couple ideas to create an impressive gift basket to give to neighbors, thank your children’s teacher or exchange with relatives. Create a flavorful bread dip by adding dried herbs to olive oil with balsamic vinegar. Team this with a pair of bread loaves from your favorite bakery along with a few living plants for their kitchen. Since it’s pasta season, so make a seasoning mix to sprinkle on warm noodles, luscious pizza or baked lasagna. In a small spice container, mix four tablespoons of dried basil, two tablespoons of dried oregano, two tablespoons of dried thyme, two teaspoons of granulated garlic, and half a teaspoon of salt. To make a gift basket, give this blend with a couple boxes of your favorite pasta, homemade or store-bought pasta sauce and olive oils. Tag @thatstastyorganic on Instagram and hashtag it #thatstastyorganic. Oh… and make sure to check our flavor finder so you can sniff us out in your neck of the woods.